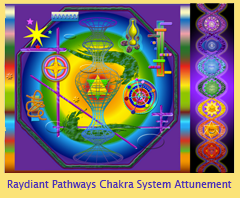 Raydiant Pathways are the culmination of many years of experience and training in the mind-body realm of healing. Working literally thousands of hours in the lightbody fields, where memory of your experience is stored and your innate intelligence for health and success is templated, Peter Kime, Healer-Artist-Alchemist, discovered a way to combine colors, shapes, and lines into a visual architecture that effects change at both conscious and subconscious levels of your reality. Starting as pen and pencil drawings, these images evolved into Raydiant Pathways. Click the video (right) to PLAY. So just what is a Raydiant Pathway? The short answer is a Raydiant Pathway is a pathway to your most authentic, intelligent, capable, and courageous self. Completing a Raydiant Pathway helps you turn past, present, and future stressors or challenges into a renewed sense of self, clarity, purpose, and opportunity. Working in person or via Screenshare online, Aliess, co-founder of Raydiant Day (and Peter's wife) begins by asking you what you want to change or be different in your life and helps you identify the next right step, big or small, that will make the biggest difference to you. From there, she helps you articulate a positive new outcome, and takes you on a Raydiant Pathway to clear your path for that goal. She will guide you in engaging your intention and visually playing with the Raydiant Lightware™ images on your Raydiant Pathway. In the process, your higher intelligence will release the conscious and subconscious patterns that can no longer operate in the same reality as your new goal. It's that simple. You move forward according to the level of change you're ready for, and let go of what you no longer need. Call Aliess at 847-644-9834 to schedule a free 15-minute consultation. She is a gifted inner guide, ready to help you improve your relationship with yourself—to digest fear and re-source your intelligence and freedom to express your true heart's joy professionally. For more information about what challenges, issues, and goals you can use Raydiant Pathways for, click the article links in the menu below. The Raydiant Lightware menu (right) takes you to the core technology and how it works, and a brief description of the different Lightware panels. To see more, visit our YouTube Channel.